I get into school early knowing that there is no overnight miracle that will have turned my puff pastry into anything remotely close to being useable. Chef Paul knows as well. He takes me into the prep kitchen where he has started a new batch for me. What can I say? I get my own one-on-one Masterclass. He will roll turn and rest three times while I am in the demonstration class. I will have the best pastry to produce the pithivier today and the vol-au-vent tomorrow. And the pay off? I have to prove to him that I can make it myself. On the way to school I had picked up a huge bag of bakers’ flour and a tray of butter knowing that I can’t complete the course without mastering puff pastry, and aren’t I making a meal of it? If I thought yesterday’s class was hectic, today’s is even busier and Chef Francis starts the demonstration telling us that workflow will be very important if we are to get through it all at anything like a reasonable hour. 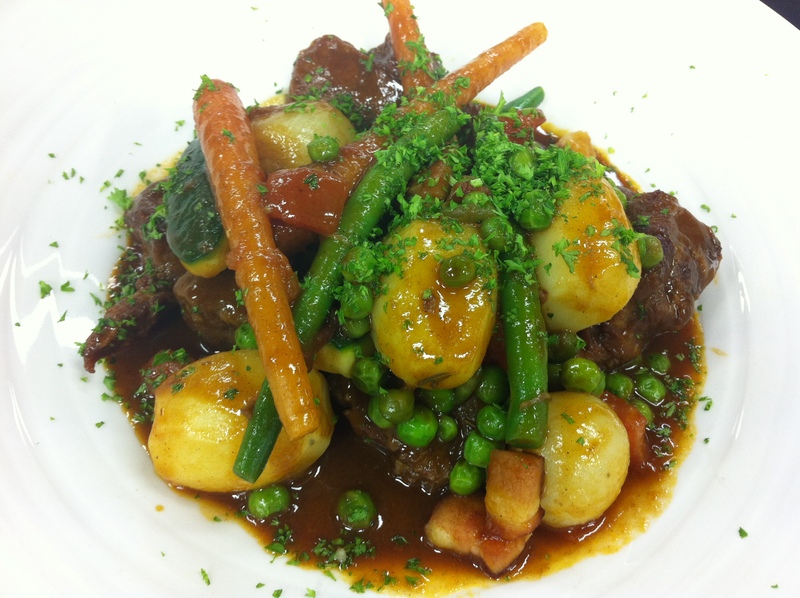 The lamb navarin he creates for us is truly spectacular. The lamb is so tender, the sauce is rich and tasty and the vegies are spot on. I think this dish engenders more oohs and aahs than any other so far. His pithivier is equally delicious – an enclosed puff pastry case filled with frangipane. We also need to produce brioche for tomorrow’s class. There’s a real buzz of activity in the kitchen today. Chunks of lamb shoulder are being browned, food mixers are whirring with the eggy brioche mix, and pastry is being rolled to 4 mm (yes seriously, it has to be that precise). We’ll also be turning the vegetables later for the navarin. Chef bustles around the kitchen trying to keep us all on track. He’s constantly asked questions as he does his rounds. He needs to check the consistency of all the brioche before we add the butter. I feel sort of under control although conscious that I haven’t turned vegetables for a while – always a challenge. Chef Francis is aghast when he sees that my brioche isn’t yet in the prover. The dough has to double in size, be knocked back, placed in the blast chiller and then cooked for about half an hour. Yes, it’s going to be a late night. 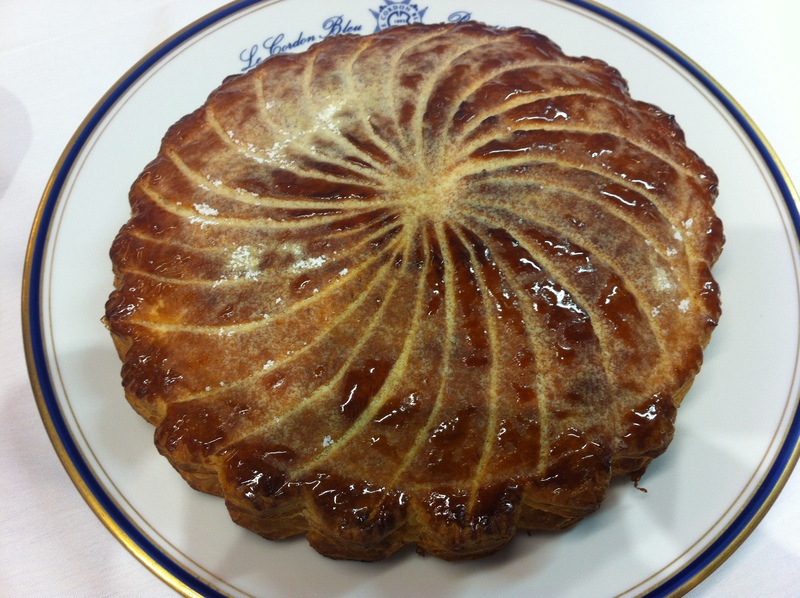 Thanks to Chef Paul the pastry of my pithivier is great but I don’t achieve the required gloss it needs. Others did, so I can’t blame the oven even though I’m pretty sure I did what was asked. It’s service time and I am proud to present my lamb. It’s really good. Well it had to be, didn’t it? Imagine the only kiwi girl in the class not producing a great lamb dish! Beautiful, beautiful looking food. 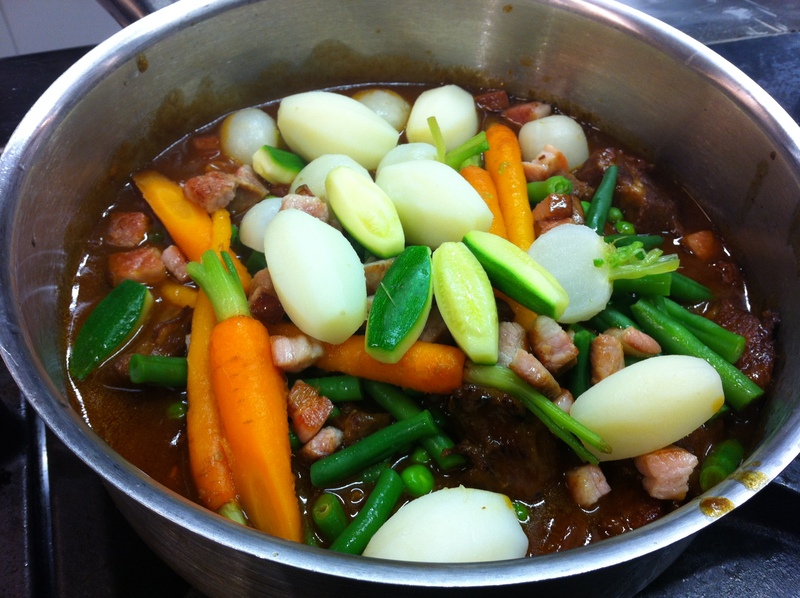 The Navarin looks amazing. No ordinary stew for sure. Is it made differently to stew or is it the Gallic flair? Heather great to see you’re back in the thick of it. For some reason on the road the chow caio decided it was junk – rescued it from oblivion but missed the first 4 posts. Can I read them at a website address in total? All the best for the rest of it. Will be back in NZ soon after 3.5 months away. More than ready to be back in Wellington. Hope to catch up with you and Mike before Christmas but it looks like you’ll be full-on until then. Look forward very much to cooking for you and Stephen early next year.